mes the sun won, sometimes not. I was looking at the sky often to check what was going to happen. Looking at this corrugated iron rooftp (underneath it there are cooling equipments) I was thinking that, maybe, isolating it from other building parts, just keeping it and the sky, could be a good idea. So I took the photo, and this image is the result, quite surreal. I’m almost sure that most viewers first impression is“what he hell is this?”, and yes, this is what happens when you concentrate the image just on a small part of what is in front of you. Without this “extreme” framing I believe that nobody (me first) was noticing that strange metal roof coverage. Technically speaking, I tried with several tricks to avoid the Moiré effect, but with very little results, so I leaved it as is. 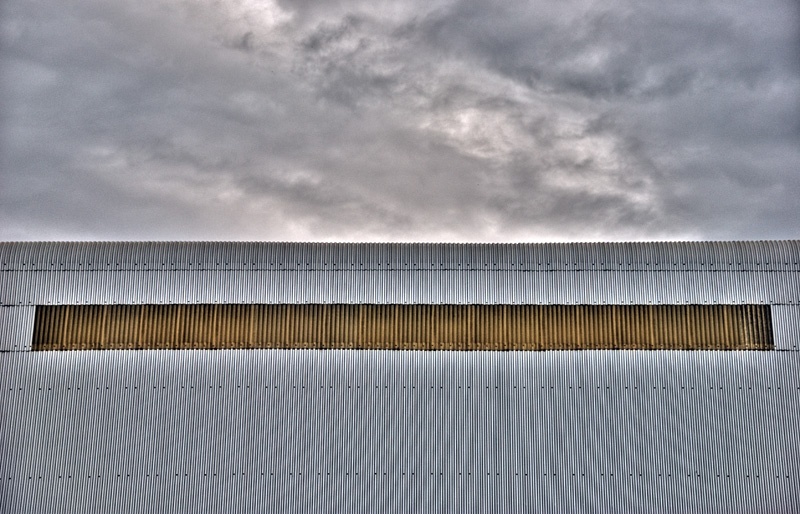 This entry was posted in Architecture, Color, Landscape and tagged cloud, clouds, corrugated iron, cover, day, effect, graphic, HDR, image, minimalist, Moiré, pattern, rooftops, sky, soft sunlight, strange, sun, surreal, trick, weather. Bookmark the permalink. Beautiful in every way! So sharp it almost makes my eyes tear. Excellent shot! That pattern makes my head spin 😀 And the pastel colors are perfect too. Love the abstract graphic simplicity. Excellent! I like bottom part of the image, and I just imagining how it could look like with damn blue sky? Figurative and we like the play on lines and structure. One of my favorites here, great composition and nice range of colors.